WASHINGTON -- President Donald Trump's embattled Chief of Staff John Kelly is back in the spotlight this week as Trump prepares to overhaul his communications team amid a string of staff departures. 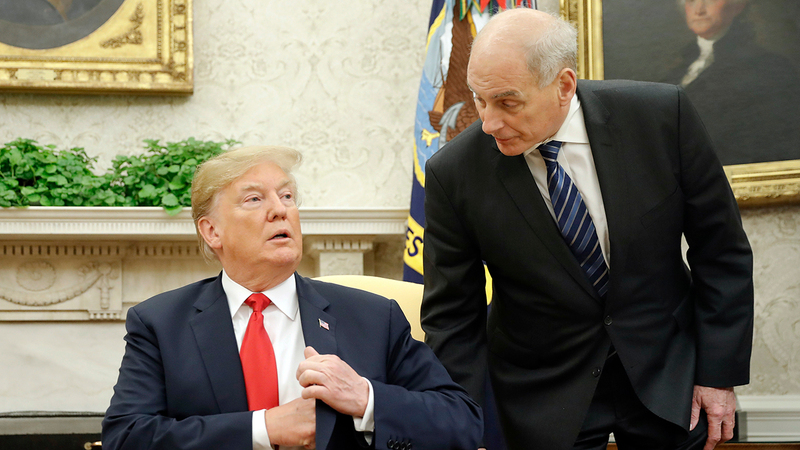 In what has become a parlor game in Trump's Washington, rumors swirled about Kelly's fate Thursday as the president sounded out allies about potential replacements for the retired four-star general. Kelly is credited with bringing order to the West Wing but also grates on the freewheeling president. Two possible replacements: Trump's budget director, Mick Mulvaney, and Vice President Mike Pence's chief of staff, Nick Ayers, according to two people with knowledge of Trump's thinking. The sources spoke condition of anonymity because they were not authorized to discuss personnel matters. Trump often openly muses about replacements for his aides without follow-through, and speculation has bubbled up about Kelly and other aides in the past without action. The White House pushed back Thursday on the notion that Kelly's days in the West Wing were numbered. White House spokeswoman Lindsay Walters said she had spoken to Trump and Kelly, and said both disputed the reports. Trump "said it is absolutely not true and that it is fake news. I've also spoken to General Kelly, who said this was news to him," Walters said. But the White House has previously denied talk of impending staff shake-ups that later came to pass. The long list of White House staffers who have recently left or are planning to go in the coming weeks includes legislative director Marc Short. Kelly has told confidants he currently has no plan to leave and has made no formal preparations to do so, according to one person with knowledge of his thinking. But he has also told people close to him that he'd be happy if he made it to the one-year mark in the position, which would mean he stays until late July. The latest speculation about Kelly comes as he has seen his White House role diminished in recent months. Trump and Kelly have drifted apart, as the president has chafed at the retired general's attempts to impose order. The president has increasingly followed his own counsel and added more like-minded aides to his staff, many of whom have direct access to the Oval Office without going through Kelly. That list will soon include former Fox News executive Bill Shine, who is expected to join the administration as deputy chief of staff for communications. Trump has discussed replacing Kelly before, and any personnel changes should be considered tentative until he carries them out. Rarely does the president directly fire anyone, frequently letting out-of-favor aides dangle in limbo for months. Ayers did not immediate respond to a request for comment. Mulvaney is focused on his current work, said an administration official who was not authorized to speak on the record about staffing issues.